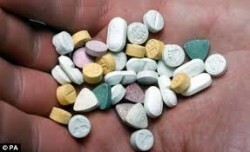 Hallucinogenic drugs can cause a variety of physical and psychological effects. Here is a list of the most common ones. There are several different types of hallucinogenic drugs, all of which can be extremely potent and cause severe delusions. It can also be difficult to determine whether or not these effects will be positive or negative, depending on a number of different factors. LSD is a common hallucinogenic drug. Methods of use: According to CESAR, “The most common form of LSD is a liquid that has been transferred onto a small paper square.” The square is usually chewed and swallowed. It can also be inhaled or injected. Hallucinogens are any drugs that can cause a distorted sense of reality and perceptions as well as intense visions, sounds, or sensations that aren’t really there. These drugs are abused recreationally for exactly these reasons but may be extremely dangerous. They can all cause intense, harmful reactions in the short term, and some may cause addiction, mental disorders, and dependence in the long term.